The special Speedmaster model created for Baselworld 2005 commemorates not only the 40th anniversary of the first space walk, but also the 40th anniversary of the Speedmaster’s flight qualification for manned spaceflight missions. These important milestones are celebrated with a distinctive model with a blue dial and matching blue aluminium ring on the steel bezel. As a limited edition, the Omega Speedmaster Professional Gemini IV 40th Anniversary, like so many Speedmasters before it, is sure to be in great demand. The Gemini space exploration programme was developed as an intermediate step between the Mercury and Apollo programmes. It was named after the third constellation of the zodiac, featuring the twin stars Castor and Pollux, in allusion to the two-man spacecraft. The main objectives of the programme were, among others, to subject two astronauts and their equipment to long-duration flights and to perfect methods of re-entry and landing the spacecraft at a pre-selected land-landing point – both of which were important for later trips to the moon. The Gemini 4 mission that took off on 3 June 1965 was only the second manned mission in the Gemini programme, yet it nevertheless lasted 4 days, 1 hour, 56 minutes and 12 seconds and included the first-ever extra-vehicular activity. Not only did the historic press photos of Edward H. White’s 36-minute space walk capture the world’s imagination, they also stunned the people at Omega, who noticed he was wearing one of the brand’s Speedmaster chronographs. 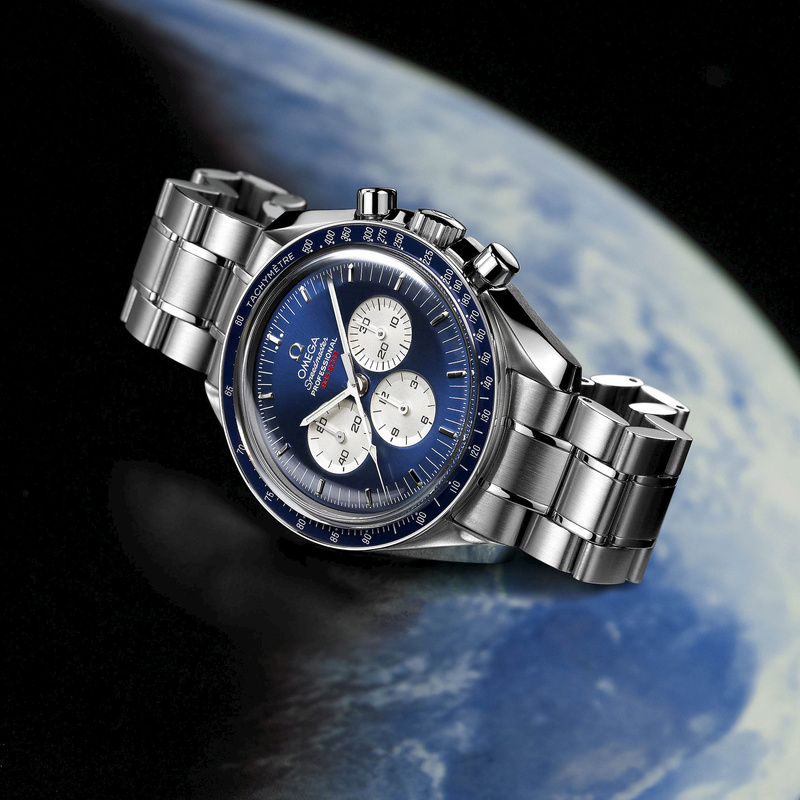 Having requested confirmation from NASA that White was indeed wearing a Speedmaster, Omega discovered one year later that its chronograph had in fact been flight-qualified for all manned space missions by NASA on 1 March 1965. In fact, it was a choice that was easily made, since it was the only chronograph that withstood the extreme conditions imposed by NASA’s tests. Later the same month, the Speedmaster was for the first time worn officially on the Gemini 3 mission (it had already been worn in space by Walter Schirra, who had purchased it himself, on the Sigma 7 mission in 1962). Though greeted with considerable jubilation at the brand’s headquarters in Bienne, Switzerland, this sensational news led to the most minor of changes to the watch: the addition of one word on the dial, turning the humble OMEGA Speedmaster into the legendary OMEGA Speedmaster Professional. Even forty years after being flight-qualified by NASA – and nearly fifty years since it was first launched – today’s Speedmaster Professional still bears more than just a striking resemblance to the models used in the Gemini programme. Equally, the legendary hand-wound chronograph movement used in the Speedmaster has also undergone relatively few modifications to bring it in line with today’s mechanical watchmaking standards. In its current appellation, calibre 1861, it offers a power reserve of 45 hours and has rhodium-plated surfaces with polished bevelled edges, special wave decoration and circular-graining with gold-plated engravings. The Gemini 4 limited-edition Speedmaster is characterised by its blue dial and silver counters for the 30-minute and 12-hour chronograph counters and continuous seconds. The blue theme is also continued on the bezel, with the familiar tachymeter scale reproduced on a blue aluminium ring. The commemorative nature of the timepiece is indicated by a subtle red engraving 1965-2005 below the Speedmaster name at 12 o’clock on the dial. The applied Omega symbol above the name, as well as 12 rhodium-plated hour markers, also add a hint of luxury and indicate that this Speedmaster is special. In all other respects, the watch remains a classic Speedmaster, with the same case, bracelet and hesalite crystal found on the “Moon Watch” – the standard Speedmaster Professional model. However, one of its most striking features is destined to remain hidden most of the time, since it is the distinctive Gemini 4 mission patch, bearing the names of the crew, McDivitt and White, and an illustration of the first space walk, that is etched in colour on the sapphire crystal case back with the engraving “First Space Walk 40th Anniversary” and the limited-edition number (0001/2005). In recognition of the 40th anniversary year, only 2005 of these models will be produced and will be offered in a special gift box. Naturally a must for any Speedmaster collector! This entry was posted in Press Release, Speedmaster Professional and tagged Gemini 4, Limited Edition, Moonwatch on March 29, 2005 by Dale Vito.